Potatoes are widely used in cooking and traditional medicine, due to its nutritional and medicinal properties. Potatoes – medicinal product. Approximately 20-25% of the weight of tubers comprise carbohydrates (starch) 2% – proteins and 0.3% – oil. Tuber protein is rich in various amino acids and belongs to the complete protein. Potatoes contain high potassium (568 mg per 100 g wet weight), phosphorus (50 mg), a significant amount of calcium, magnesium and iron. In tubers found vitamins C, B, B2, B6, B RR, D, K, E, folic acid, carotene and organic acids: malic acid, oxalic acid, citric acid, caffeic, chlorogenic, and others. Due to the high content of potassium potatoes promotes excretion of water and salt, which improves metabolism, so the potato is considered an indispensable product in the diet food. Especially rich in potassium are baked potatoes, preserves maximum nutrients. Potatoes even recommended to use in hypertension, atherosclerosis and heart failure. 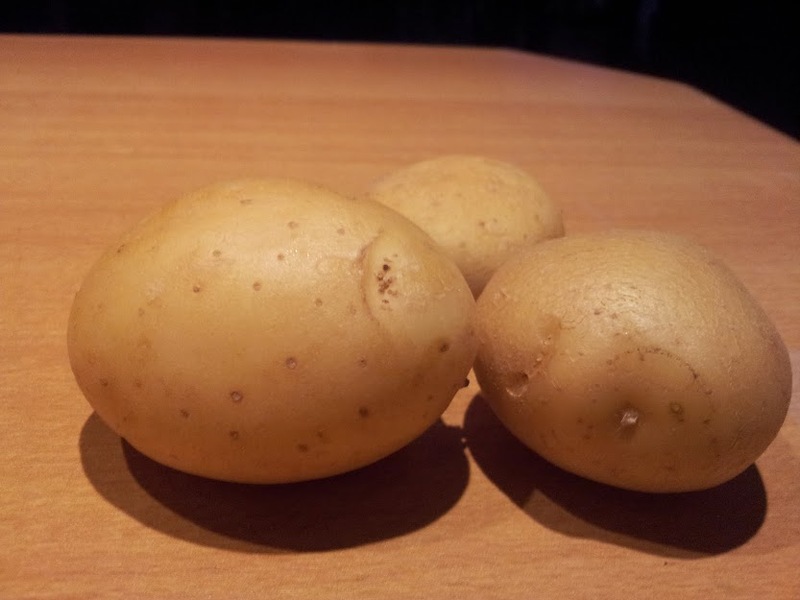 The high content of carbohydrates in a rather high calorie potato – nearly 2-3 times higher than in other vegetables. Therefore, those who are inclined to corpulence, should limit his passion for potatoes. However, and all the rest do not abuse potatoes. Starch contained therein in its pure form is not absorbed by the body,that is why better to use potatoes no more than a few times a week. At the same time the potatoes shows very useful properties in the fight against gastritis with high acidity, gastric and duodenal ulcer. Besides potato starch have proteins, it also has ascorbic acid, and many vitamins. Treatment of potatoes: folk recipesIn allergic spots, post-burn tracks, burst blood vessels should be daily wipe face with a slice of raw potato tuber. Potato mask refreshes the face, removes signs of fatigue. Another using: Hot potato crush, add egg yolk and a little milk to make a thick viscous slurry. Mask in the form of heat apply on face and cover your face with warm, wool is better, with a handkerchief. Hold for 20 minutes. Rinse with warm, and then rinse with cold boiled water. Potato facial mask is not only refreshing, but also nourishes, smoothes wrinkled skin. Dry skin is soft, smooth and elastic. Especially useful mask of new potatoes boiled in their jackets, women over forty. Mash the potatoes, mix with sour cream and apply on face. After 20 minutes, rinse. Raw potato juice cleanses the entire body. With carrot juice and celery juice it is very good help for digestive and neurological disorders. If every day you will put down hands in potato broth by 5 minutes, the skin becomes silky and soft. Bath of broth – effective method of dealing with brittle nails. Daily use concentrated potato broth is able to overcome even unfired fungal infection. Beware of greenish and sprouting of potato tubers – they contain harmful substance solanine. Mini vegetables come up with the Japanese in the 70s, and the Swiss have developed the technology on which the seeds of common plants and their early and dwarf varieties can be grown full but miniature fruit. No genetically engineered potatoes: mini is no different from the usual, except for size, and the size is caused solely by the terms of growing. This is convenient to bake potatoes and cook – no need to cut and can be worn thin skin.